This Destruction Warlock guide is primarily intended for use at level 90, in PvE environments and Raids. However, the some of the principals will still apply in PvP and during the leveling process, so if you’re looking for advice on leveling your Warlock, check out our Warlock Leveling Guide. All three of these talents can be useful under varying circumstances. Dark Regeneration is an on-demand heal that also increases the effectiveness of healing for a short while after, not a bad option. Soul Leech provides a constant healing effect as your spells deal damage, ideal for fights with consistent damage. Harvest Life is ideal for AoE situations, but not much else. The optimal choice for most encounters is Mortal Coil as it provides an additional heal effect. Howl of Terror and Shadowfury are both viable in situations that demand Crowd Control, but otherwise inferior. All three survivability mechanics are viable choices. Pick whichever one you find most useful in a specific encounter. Dark Bargain is perhaps the most interesting of the three in that it provides the most powerful survivability mechanic, but on the longest cooldown. Soul Link allows you to tank big hits on a more consistent basis, but also puts your pet at more risk of dying. Sacrificial Pact provides an absorption shield on a relatively short cooldown. A strong talent. Unbound Will is the most useful as it provides an invaluable debuff remover while the other two provide somewhat more situational benefits. Burning Rush could potentially be useful on movement heavy fights, not much else. Blood Fear seems rather useless for most encounters, or rather all of them. Grimoire of Supremacy has very competitive DPS and is a stable, easy choice. Grimoire of Service is the least appealing of the three, but has its uses on fights that require burst damage. Grimoire of Sacrifice provides optimal DPS. All three talents are viable in certain situations. Archimonde’s Vengeance is great for situations in which you expect to take large amounts of damage. Kil’Jaeden’s Cunning is ideal for movement-heavy encounters. Mannoroth’s Fury is the optimal choice for AoE fights where you need extra range on your spells. The Minor glyphs are all cosmetic, there’s no utility to any of them. Pick what you like. Primary stats: Intellect >>> anything else. Stats weights are for tier 14 gear as calculated by SimCraft. Values for secondary stats will vary depending on your exact gear, team make-up, and style of play. Int is about twice the value of the Crit/Mastery. Destruction Warlocks use Burning Ember as their resource as opposed to the Soul Shards of Affliction and the Demonic Fury of Demonology. Burning Embers is generated through the use of Incinerate and occasionally Shadowburn, should the target of the spell die within 5 seconds of casting it, although as Shadowburn already costs a Burning Embers this is merely a cost-free Shadowburn rather than an extra Burning Embers. Chaos Bolt, Fire and Brimstone, Ember Tap, Flames of Xoroth and Shadowburn all use one Burning Embers to cast. Your first priority is using Conflagrate as it’s available to generate charges of Backdraft which reduces the mana cost and cast time of your Incinerate spell by 30%. Conflagrate operates on a charge system and each use of it generates three stacks of Backdraft. Using Conflagrate again will refresh the timer left on Backdraft and add an additional 3 stacks. Maintain Immolate on your target at all times. Incinerate is your primary attack spell and should be cast as often as possible to build burning embers for Chaos Bolt and Shadowburn. Shadowburn replaces Chaos Bolt as your method of expending Burning Embers once your target reaches 20% health. If the target of Shadowburn fails to die within 5 seconds you will regain 15% of your total mana instead of having your Burning Embers returned. When facing multiple targets use Fire and Brimstone to spread Immolate to your targets while otherwise maintaining your Incinerate use. Rain of Fire should be cast as often as possible as should Havoc. Dark Soul: Instability boosts your critical strike chance by 30% for 20 seconds and should be used on cooldown. Summon Infernal and Summon Doomguard share a cooldown and therefore you will have to make a choice between the two depending on the encounter. The Infernal is superior for AoE encounters while the Doomguard is best used for single target DPS. Both last for 45 seconds with a cooldown of 10 minutes meaning it’s unlikely that you’ll be able to use them more than once or maybe twice at best during a single encounter. Grimoire of Supremacy upgrades the Infernal into Summon Abyssal and the Doomguard into Summon Terrorguard, however the recommended talent, Grimoire of Sacrifice, prevents you from using these anyway. Life Tap is used to regain mana, however, as it costs life, both the passive effect of Grimoire of Sacrifice being active and a number of other survivability cooldowns can be used to counter the loss of health necessary to refill your mana pool. Unending Resolve reduces all damage taken by 40% and prevents your spells from being interrupted or silenced for 8 seconds on a 3 minute cooldown. Soulshatter reduces all threat by 90% on a 2 minute cooldown. Soul Leech makes your Incinerate, Shadowburn, and Chaos Bolt grant you shields that protect you and your pet, absorbing 15% of the damage dealt. Harvest Life causes Drain Life to deal 50% more damage (40 yd range) and heal 100% more. Dark Regeneration restores 20% of you and your pet’s maximum health over 12 seconds and increases all healing received by 25% for 12 seconds. This ability has a 2 minute cooldown. Grimoire of Sacrifice is the recommended choice for this tier. While the effect is active you regain 2% of your maximum health every 8 seconds, and the damage of Incinerate, Chaos Bolt, and Shadowburn is increased by 20%. Helm enchants are gone as of Mists of Pandaria; shoulder enchants all come from the Inscription profession. As with gems, your Nethromancy bonus adds to the Int bonus from any appropriate enchants. Note that if you could be a Pandaren you’d get twice the food buff, but you aren’t so you can’t. All food buffs last one hour and apply only one stat. All of the professions provide some benefit for Warlocks of any spec, though clearly some are better than others. Even the gathering professions have some value, though you might be better served by using those to build a larger gold stash. Orcs make pretty decent Destruction Warlocks, as do Gnomes, but it’s not by a lot. Best Alliance? Gnome, for the Mana. Pandarens will not be able to become Warlocks. Orc– Big, green, massive… Too bad you can’t use an axe as a Warlock. The increased pet damage (on command) makes the Orc one of the better Warlock races. The decreased stun duration is nice for PvP and might have some occasional PvE utility. Undead– What’s better for Affliction then being already dead? Will of the Forsaken is a nice PvP skill (anything that breaks Fear, etc is a nice PvP skill) and it can break a few PvE mechanics. Touch of the Grave drains life and heals you for the same amount. This is a passive effect which will actually add a bit to your DPS. Arcane Torrent is a nice melee range silence which also restores a bit of mana. Well, ok, they look good. A truly devastating Warlock Ability. Really. Increased casting speed, when Berserk, is very nice. More damage vs beasts is very nice for leveling and some PvE encounters. Reduced duration of movement impairing effects (Da Voodoo Shuffle) might have some occasional use. Goblins are just as willing to sell your soul as they are anything else. Goblins can Rocket Launch forward, which is a nice movement/escape ability. Increased Haste is nice in end-game raiding, even though it’s just an okay stat for you. Human – A decent Warlock race. the escape ability is nice for PvP and a few PvE mechanics. Gnome – Now why would a Gnome be a Warlock? Shouldn’t they be able to summon mechanical demons? their escape ability might break some mechanics. Stone Form is a nice PvP talent, and occasionally useful elsewhere, since it washed bleeds and effects and reduces some damage. Worgen– Fur, fleas, snuffling… But they certainly look the part. An increased crit chance is nice. Are you working on your Destruction Warlock to reach the end-game raids? Already there and leveling another class/spec? Need yet another 100 in your group? With thousands of quests and a few bazillion mobs to grind the trip to top level can take a while. A long while, even if you’re done it before. There’s an easy solution which will speed up your leveling, by a lot, and that’s an in-game leveling guide: Zygor’s Guide. 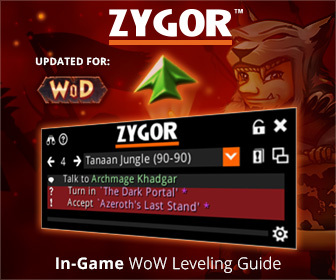 Zygor practically automates the whole leveling path for your ‘lock, regardless of which level you start from. You still have to play the game, of course, but the “where to go and what to do” part is neatly taken care of. You’ll never wonder what to do next, which makes the trip to 90 a whole lot easier. Pick your starting point and Zygor will show you exactly where to go, what to do, and the best order to do it in. It automatically updates and advances as you complete tasks and quests, sets a way-point arrow automatically (always showing you where to go next,) and includes all the important quest info. You will probably never need to look at your quest log again, much less stop mid-play to browse some website. Zygor is always quickly updated for all patches and expansions and includes some nifty extras, such as an in-game talent adviser and more. Grab your copy here and get leveled fast, or read our Zygor review first. hey, is this updated for the current patch? Mostly it’s Ok and should server you well for 5.4, but there are some things that need updating. A talent change (howl of terror being replaced by Demonic Breath,) to name one. I’ll put it in the queue and get to it soon.